The much awaited $35 tablet is finally a reality as it has been launched by Human Resources Development minister, Kapil Sibal in New Delhi. It was earlier named as Saksham but now it is launched with a new name Aakash which mean sky in Hindi. The device is aiming to break the price barrier for computing and internet access. It will provide the digital computing access to the poor people in India. Aakash tablet has been developed by UK-based company DataWind and Indian Institute of Technology (Rajasthan). It is a made in India product because it is assembled in DataWind’s new production center in Hyderabad. At the launch 500 Aaksah tablets have been handed over to 500 students for testing by Kapil Sibal, HRD. 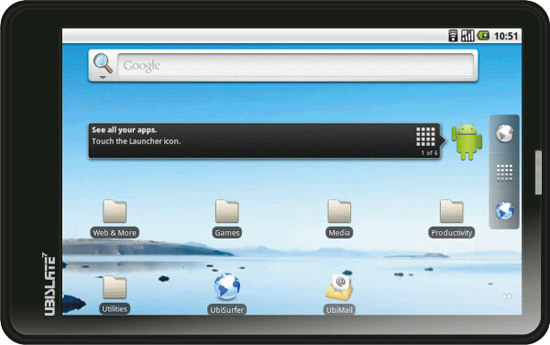 Aakash tablet is powered by Android 2.2 Froyo OS and it provides web browsing and video conferencing. It supports popular file formats like .doc, .docx, .pdf, .pptx. It provides all the great features and lacks only one thing that is poor battery life of 3-4 hours only. But that can also be ignored looking at the cheap price of the tablet. DataWind has also announced that it will also offer a commercial version of the tablet, called UbiSlate which would cost around $60. Commercial version of Aakash tablet will be available for everyone which includes a cellular modem and a SIM card slot to access the internet. It will also feature a link to Android Market which is not offered in version that is available for students. Commercial version is expected to launch later this year. Interesting – But is it a tablet, or a just a bigger mobile? Either way, the price point seems to be very attractive. Any idea on when they gonna start selling ? I will definitely buy this ! iam from pakistan how to buy this ? ?